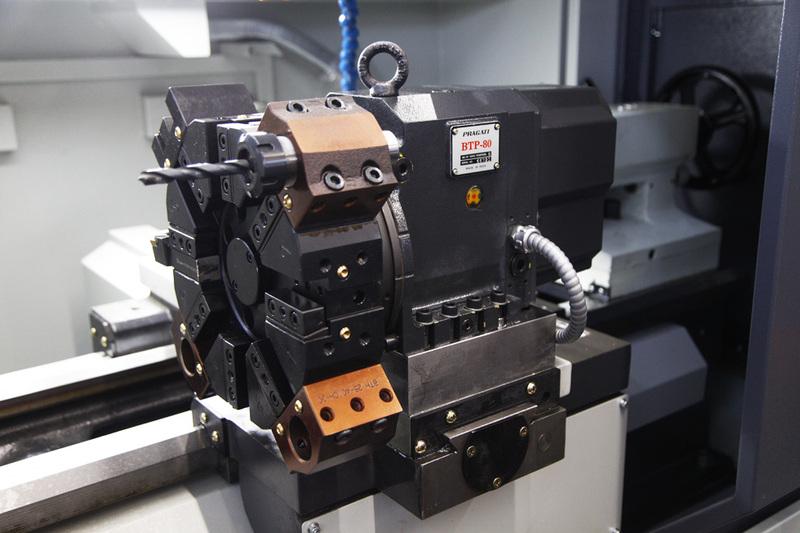 StankoMashStroy started the use of the new electromechanical 8-position turret on CNC lathes CT16A25 series. The turret is one of the basic elements of turning equipment. The new model is manufactured by the company “Pragati” (India), one of the leading global manufacturers of machine tools, turrets (tool holders, tool disks), rotary tables and ATC. The main advantages of Pragati turrets are high reliability (2 million cycles), quick tool change, and the best price-quality ratio in Russia. The use of a new Indian turret significantly improves the technical characteristics of machines manufactured by StankoMashStroy. In particular, the number of tools increases from six to eight. The tool change speed doubles. The rigidity of the machine and positioning accuracy increase. Another important advantage is the improved reliability of the turret mechanism. As well as the ability to supply coolant to the cutting point through the nozzles of the turret, which allows you to process heavy cutting.